Welcome... to Blogtobia. : Let's blow the horn for our bretheren celebrating the New Year! Let's blow the horn for our bretheren celebrating the New Year! Happy NEW YEAR all ye of the Jewish Faith! Now, I believe in the second half of the football game known as organized religion, but I wanted to pause to say hello to the many Jewish people who are in my life and who are no longer in my life for whatever reasons... and to wish you all a happy new year! 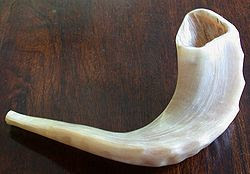 I blow this horn today for your people! Read more about this high holiday here!